A collection of 5 Chinese porcelain and earthenware snuff bottles. 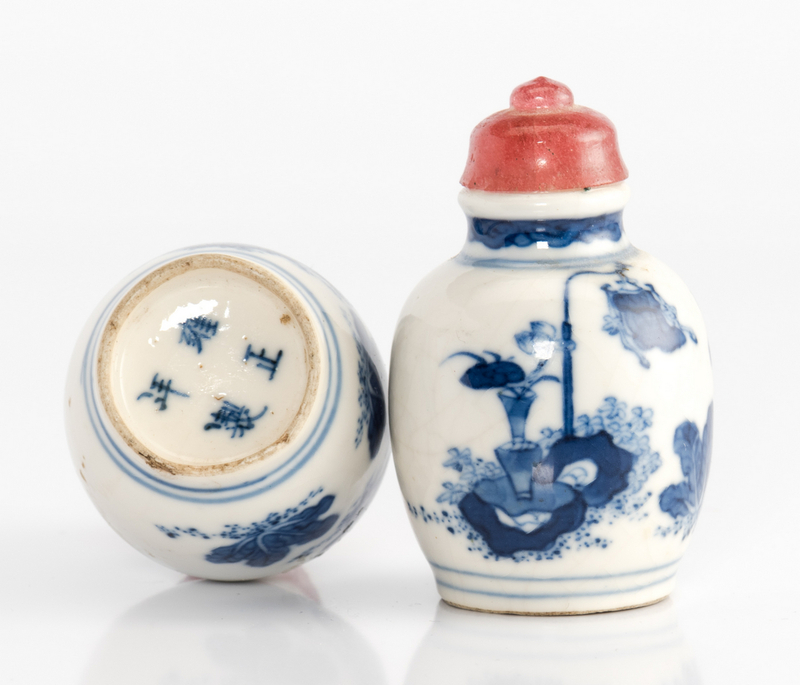 1st and 2nd items: Pair of blue and white porcelain snuff bottles, ginger jar form with carved rose quartz lids, blue Zhengde-style 4 character mark on undersides. 2" H. Likely Qing Dynasty. 3rd item: Olive colored stoneware bottle of flattened ovoid form with band of raised design to body, raised ring handles to sides, and lapis carved lid, 2" H. 4th item: Celadon glazed double gourd form snuff bottle with raised bow design to waist, 2" H. Carved wood stopper and spoon is an ill-fitting replacement. 5th item: Guan ware crackle glaze snuff bottle, Mei Ping form with red quartz and white metal stopper, seal mark to underside, 3 1/8" H. All 20th century. Provenance: The living estate of Dr. and Mrs. Benjamin H. Caldwell, Nashville, TN. CONDITION: 1st and 2nd items: Light crazing. 1 has tiny chip to underside of lower edge. Lids appear glued on. 3rd item: Stopper will not fully remove from neck. 4th item: Lacking original lid. 5th item: Firing flaw to side.